Bright and early on Saturday, April 4, I found myself driving to Thunderbird Mountain Park in Glendale, Ariz., to meet up with a group of 40 Mayo Clinic hikers and Bella, the dog. Normally, I wouldn't be up at 7 a.m. on a Saturday, but when a colleague in HR asked me to lead a group-hike at Thunderbird Mountain Park, how could I say “no?” The event was planned and organized by Employee Activities and Robert McGriff, HR Benefits, as a way to have fun in a healthy way. There were three different trails: beginner, intermediate and advanced. I was asked to lead the intermediate hike, which was 2.5 miles long and included the highest point in the park. With coffee, and water in hand, we started up the mountain around 7:20 a.m. After approximately one-fourth of a mile into our hike, the trail became fairly steep and we all began to question whether we were in good enough shape to make it to the top. Although we were a bit winded, we did in fact make it to the top -- which included a beautiful panoramic view of the valley -- and back down the mountain on the other side in about an hour. Unfortunately for my group, I later learned that I led them up the difficult side of the mountain, which was intended to be the “down side” of the mountain, not the “up side.” Oh well, we had fun, got a great workout and it counted toward our LiveWell wellness program points! 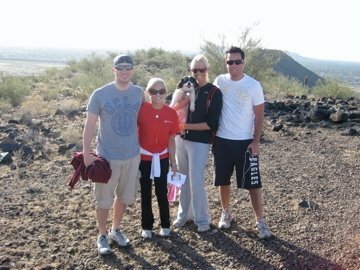 The next hike will be at McDowell Sonoran Preserve in Scottsdale, Arizona, on May 2. See you there! Hikers Bryan Benson, Bethany Rattray, Kjersti Hamlin, Bella the dog, and Adam Manty stand near the peak at Thunderbird Mountain Park. Bethany Rattray works in Human Resources at Mayo Clinic in Arizona.